Subaru sells its 9 millionth vehicle in the US to a doctor in Arkansas | Car News, Reviews, & Pricing for New & Used Cars. Back in 1967, Malcolm Bricklin approached Subaru about bringing its cars to the United States. The first models made their way to customer hands sometime in 1968. After 50 years, Subaru of America announced that it has sold its 9 millionth vehicle, a 2018 Subaru Crosstrek, to a doctor and repeat customer in Arkansas. This comes just weeks after the automaker sold its 2 millionth Outback and marks another achievement in Subaru’s long and continuously successful US operation. Dr. Hershey Garner — the owner of a 2005 Subaru Baja — was greeted with a surprise celebration at Adventure Subaru in Fayetteville, Arkansas, after he took possession of his new car. Garner’s new Crosstrek was of course a new 50th Anniversary Edition. 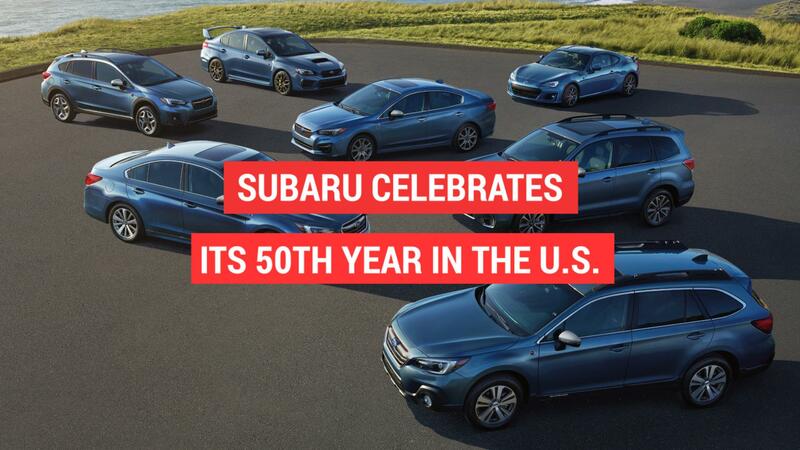 Each model in Subaru of America’s lineup got a 50th Anniversary Edition. Those cars are all painted Heritage Blue with satin chrome trim. The black leather interiors have 50th Anniversary logos in the headrests. Subaru sales have been going gangbusters. Crosstrek sales were up an astounding 88.7 percent in March 2018 compared to March 2017. As a whole, Subaru marked its 49th month of 40,000-plus sales. The automaker has broken sales records in the US nine years in a row. Things show no sign of stopping anytime soon.